Rocky Mountain House National Historic Site brings Canada's 19th century fur trade days to life with engaging interpreters, interesting exhibits, and unique interpretive programs. 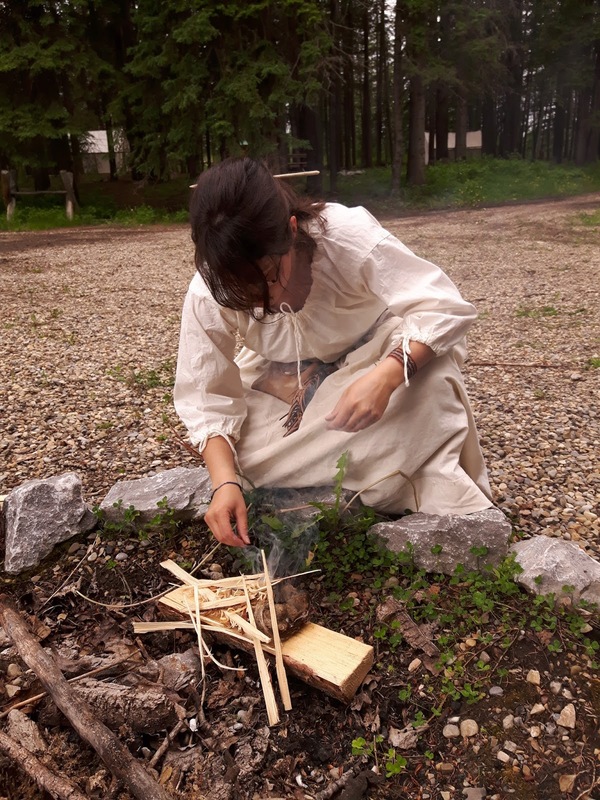 Learn to start a fire with flint and steel, cook bannock over a fire, or make your own candlestick holder in the blacksmith shop. For an unforgettable experience, live like a trapper and stay in a tipi or trapper's tent! Evening sun filters through the trees as bannock sizzles in the pan. After an afternoon exploring Rocky Mountain House National Historic Site, we eagerly anticipate the crispy on the outside, soft on the inside traditional bread. It is every bit as good as we imagined and pairs perfectly with smokies. With daylight to spare, the girls beg to visit the tipis and bison "one more time". 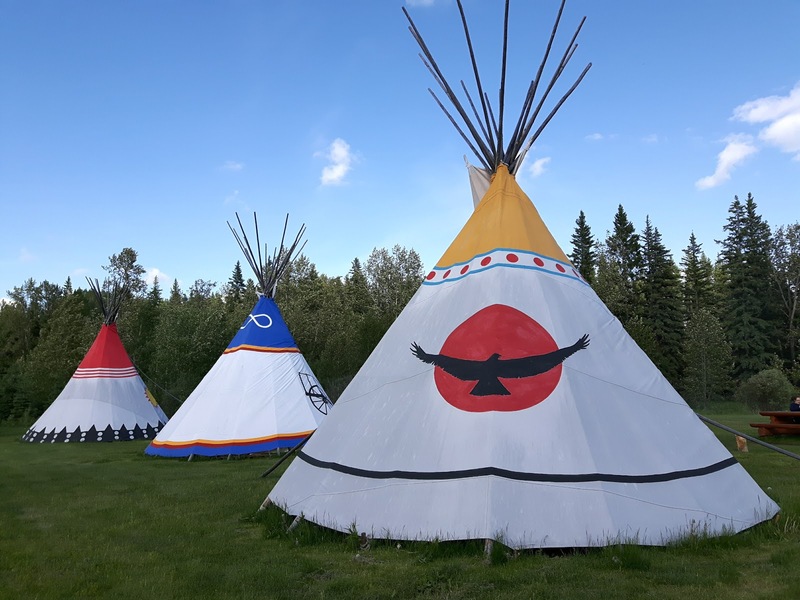 It's not every day we camp in a National Historic Site and see sights like these, so of course we say yes! From the lofty lookout over the bison paddock, we watch bison roaming the range as they did centuries ago. Jagged peaks - the Rockies - dominate the western horizon and we marvel at how David Thompson discovered a way through them to the Pacific Ocean. On our way back to camp, we check out the tipis, 1967 Canoe Race display, and site of the first fort at Rocky Mountain House. A metal frame reveals what the North West Company Fort looked like in 1799 and interpretive signs describe what was there. There is so much to learn and experience, but first, we must sleep. Our home away from home is a pair of cozy trapper's tents furnished with rustic furniture. The girls are delighted to have their own beds in their own tent and settle in quickly after a cup of cocoa. As large raindrops pummel the roof, we are thankful to be snug and dry inside. Morning arrives overcast and chilly, so we take advantage of indoor activities at the Visitor Centre and Play Fort. The interpreters, friendly locals who take great pride in where they live, bring history to life. Our girls are fascinated by it all and ask question after question and the whole family learns new things about the fur trade days (1800s). When we ask what their favorite things are, they exclaim "Everything! 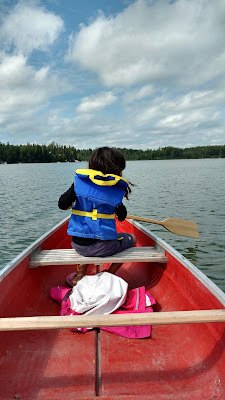 ", then say: "going down the river" to the Trading Post with the Métis (Sarah and her son), making bracelets, playing at the 3D Virtual Reality exhibit, and watching the Puppet Show (skilfully put on by Tianna and Hilary). In the afternoon, Lauren takes us on a tour of the National Historic Site. Lauren is home for the summer before returning to University where she is training to be a teacher. She seems well suited to her present and future vocation. 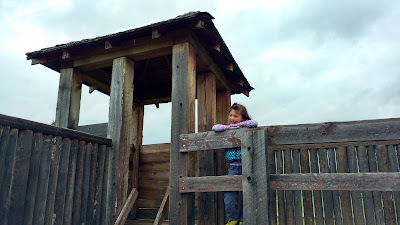 After playing at the Play Fort, we take the Chimney Trail to the Métis campfire, sites of two Hudson's Bay forts (1835-1868), graveyard, and York Boathouse. At the campfire, Sarah and Leon show us fur trade artifacts and offer freshly baked bannock. Red River Carts were built entirely of hardwood (no metal) and used in the 1800s. Holes were burned, not drilled, and each cart had a unique sound. Blacksmith shop inside the York Boathouse. As luck would have it, Marcien LeBlanc, President of the Métis Nation of Alberta Local 845 (Rocky Mountain House) and respected Métis elder, is visiting at the same time as us. An advocate for Métis culture and humane trapping, Marcien is quick to smile and share a story. He tells us about the Métis flag, Métis sash, and Red River Cart. His mother, he says, saw Red River Carts and a man on the moon in her lifetime and wondered what changes her children would see in theirs. This example of the rapid passing of time reminds us why National Historic Sites are so important. Interpretive trails (hiking only): Chimney Trail (800 m loop) and David Thompson Trail (3.2 km return) have interpretive signs and Listening Stations. We enjoyed both trails, and were surprised at how lush the forest was on the David Thompson Trail. Bike from Crimson Lake to a) Twin Lakes Provincial Park (7 km one way, gravel, single-track), or b) all the way in to Rocky Mountain House (about 13 km one way). The paved access road is good for roller blading too! Play Fort: Kids will love playing on the swing, climber, gallery (raised walkway) and bastion in this mini sized fort. David Thompson Puppet Show: This lively half hour show runs daily at 2 pm on weekends and is fun for all ages! We loved it! Listen carefully for David Thompson's nicknames (the real one and a silly one)! Women of the Fur Trade: Beading and quillwork are just a few of the available demos. Rachel showed us how to start a fire with flint and steel! My kids were so inspired, they practiced making sparks for half an hour! Rachel makes a fire without matches or a lighter! Métis campfire: Enjoy fresh made bannock, look inside the trapper's tents, and see a Red River Cart! York Boat: Could you row this huge boat from Rocky Mountain House to Hudson's Bay? It's hard to believe that the Voyageurs (paddlers) were only around 5 feet tall! 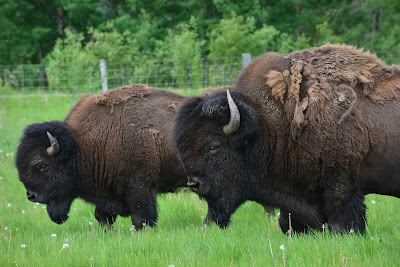 Wildlife viewing: Look for the bison in the bison paddock, birds, foxes and other animals on the 500-acre site. 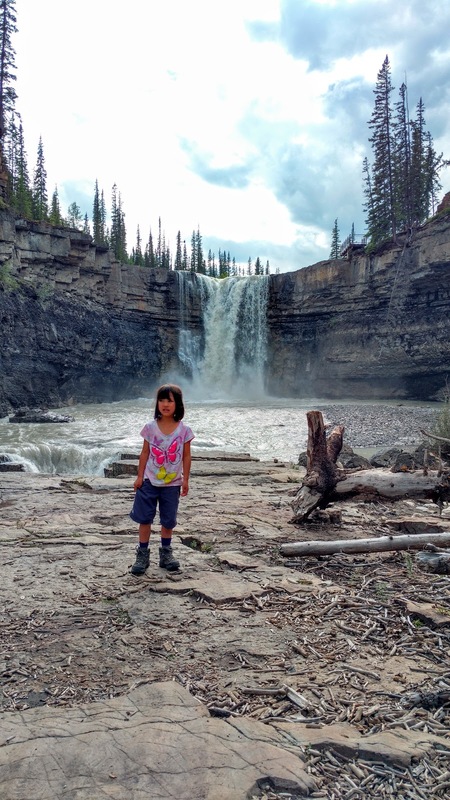 Paddling: Paddle the North Saskatchewan River and Brierley Rapids from the canoe launch near the campground. For more information, visit Rocky Mountain House National Historic Site - Recreational Activities. If you'd like to stay a while, try Heritage Camping at Rocky Mountain House National Historic Site! Beautiful tipis sleep 8 and cozy trapper's tents sleep up to 5! The tipis are out in a meadow and the trapper's tents are in the adjacent woods. Both areas have picnic tables and fire pits. We chose the trapper's tents so we could sleep on beds for a change. Everyone was so comfy, we all slept in an hour later than usual! 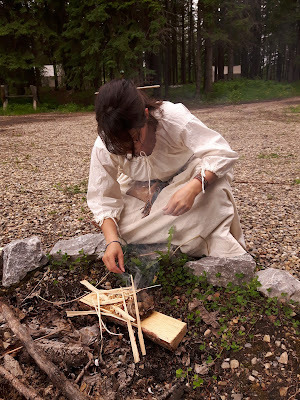 To our surprise, the Heritage Fur Trade Camp Kit includes: bison hide, period cooking kit and utensils, flint/steel fire-starting kit, bannock mix, trapper’s tea, spices, oil and soap. We had enough bannock mix for 2 nights and the girls got really good at making sparks with the flint and steel (the enclosed instructions were a big help). Enameled dishes and rustic furniture made for fun photos too! The Heritage Camping area is located 1.6 km from the Visitor Centre. Gated access and a small number of camping units (6 trapper's tents, 3 tipis, 2 cabins, and a few equipped camping sites) make for a quiet campground. We really enjoyed our stay! Other camping options include: Trapline cabins (coming soon), Equipped camping (6 person tent is set up for you and all equipment is provided), and frontcountry camping (14 walk-in tent sites plus 24 unserviced trailer sites). You must check in at the Visitor Centre before 5 pm to get a key for the campground gate (n/a to frontcountry camping). Heritage camping units are walk-in camping. You can park beside your trapper's tent to load/unload and then park a short distance away. Tipis are about 50 m from the parking. The nearest water and flush toilets are at the Visitor Centre, so be sure to bring potable water with you. Tipis and trapper's tents have sleeping pads, but you must bring your own bedding. Don't forget your camp stove, cookware and utensils. Firewood can be purchased from Parks Staff who come around frequently. We got a couple HUGE bundles for only $6.80 each. Keep all food and items with a scent in your vehicle or bear-proof food lockers. If rain is in the forecast, I recommend staying in the trapper's tents. Fellow campers in the tipis got a bit wet after heavy rain (it comes in through the hole at the top). Bring a mosquito net in summer just in case. Luckily for us, the bugs disappeared as soon as it cooled off, but biting insects could be an issue in warmer weather. Learn more about camping at Rocky Mountain House National Historic Site here. Voyageurs Rendezvous Canoe Race Launch on July 1. Thousands of people come to see this epic canoe race (1600 km in 23 days!). 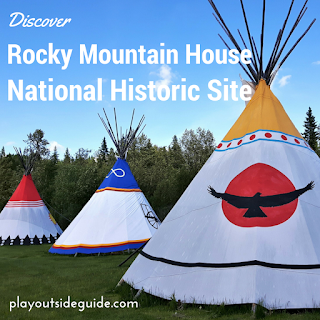 For more details, visit Rocky Mountain House National Historic Site - Special Events. For more information on Rocky Mountain House National Historic Site, please visit Parks Canada. Thank you to Rocky Mountain House National Historic Site for hosting us! All words and opinions are my own.